Zhongxiao East Rd. Sec 4. Ln 216. Alley 8. No. 12. Taipei. If you live in Southern California, and is somewhat familiar with the Asian restaurant scenes in this area, you have probably noticed the sprang of "beef noodle" joints in the last few years. Many of these beef noodle joints are labeled as "Taiwanese cuisine", which kind of puzzles me, because strictly speaking, "beef noodle" is not Taiwanese cuisine, but rather, Chinese cuisine (i.e. beef noodle originated from China, in Taiwan, some of the most well known ones are found in Chinese regional restaurants). 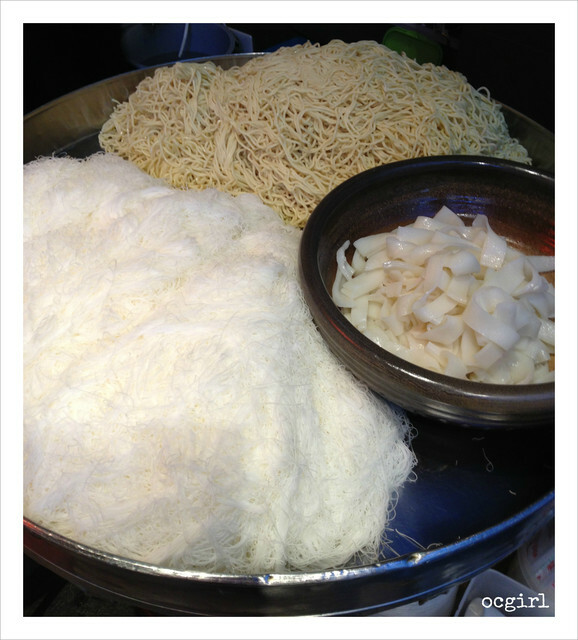 In my mind, REAL Taiwanese noodle is "Dan Tsu Noodle" (擔仔麵). 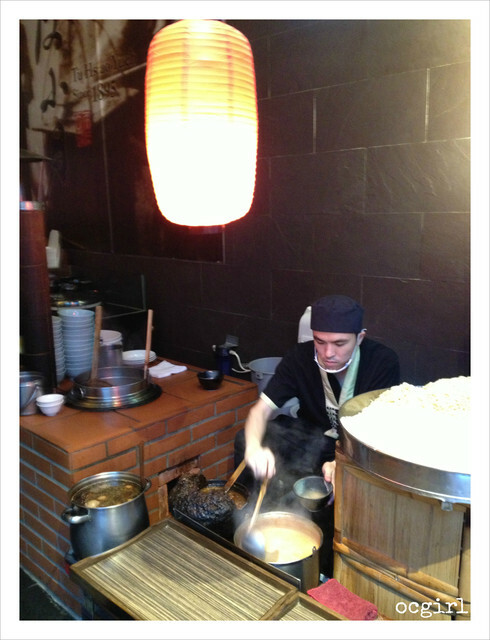 And the best place to have a bowl of "Dan Tsu Noodle" ? Du Hsiao Yueh! 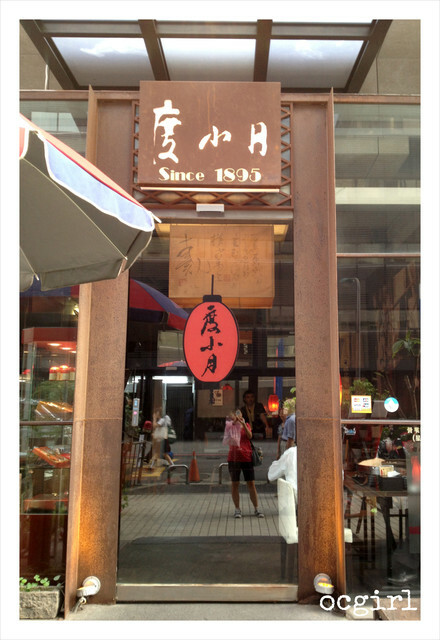 Du Hsiao Yueh originated from Tainan (台南), my dad's hometown. My dad still remembers vividly the small noodle stand just couple blocks from his childhood home. The tiny restaurant has been there forever, in fact, it has been around since 1895! The last 20 year or so, Du Hsiao Yueh has successfully transformed itself from a "street food" to a hip restaurant chain. Du Hsiao Yueh's restaurants are clean, comfortable (yes! air conditioned in the summer! ), good service, food is just as good and more variety. 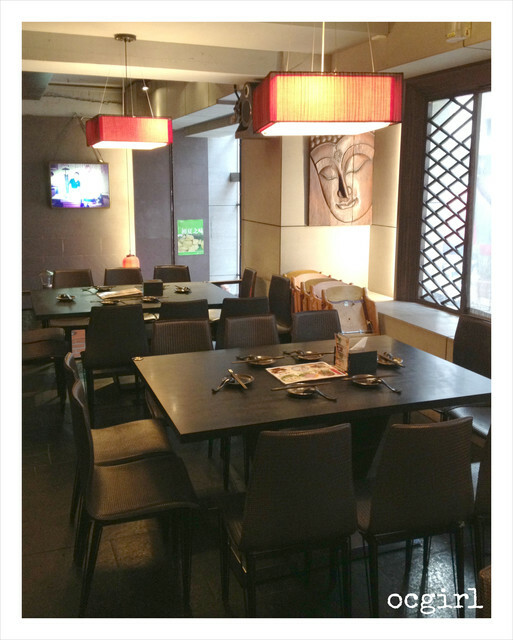 Most of all, they were able to maintain that "street food" vibe in a restaurant setting! I am very impressed with this business model, in fact, I think all Taiwanese street food vendors should learn something from them. "Dan Tsu" literally means "shoulder weave baskets"
In its earliest days, the founder of Du Hsiao Yueh would carry the noodles in these baskets and walk the neighborhoods yelling "Noodles! Noodles! Anyone want noodles??" When customers show up, he'd put the basket down and cook the noodles on the side of the street. Today, Du Hsiao Yueh replicated that scene in all of its restaurants. I LOVE watching the noodles being prepared in front of me! It's a real fun scene to watch. I wish I had video recorded this. And then you can choose with soup or without soup. I recommand go with the soup. 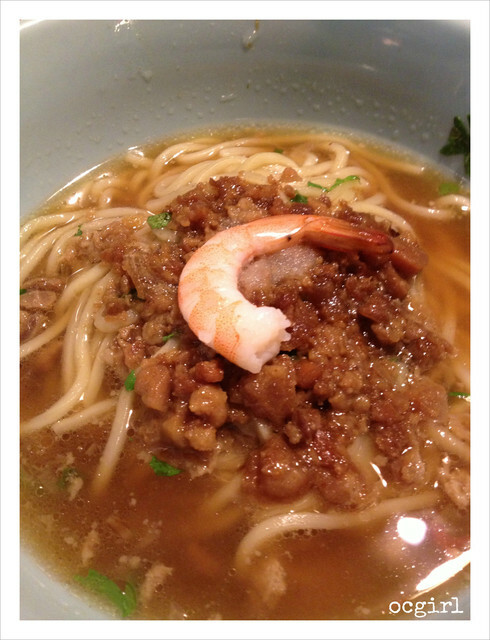 The soup is so flavorful from the shrimp and braised ground pork! 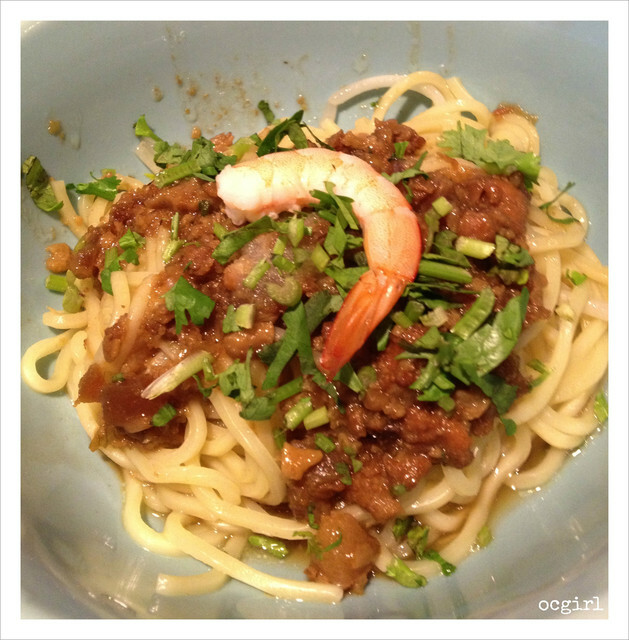 I think the soup and the braised ground pork is what makes Du Shiao Yueh's noodle so much better than others. My dad doesn't like anything soupy, so he ordered it without soup. Other than the noodles, they also offer a lot of other traditional Taiwanese dishes. 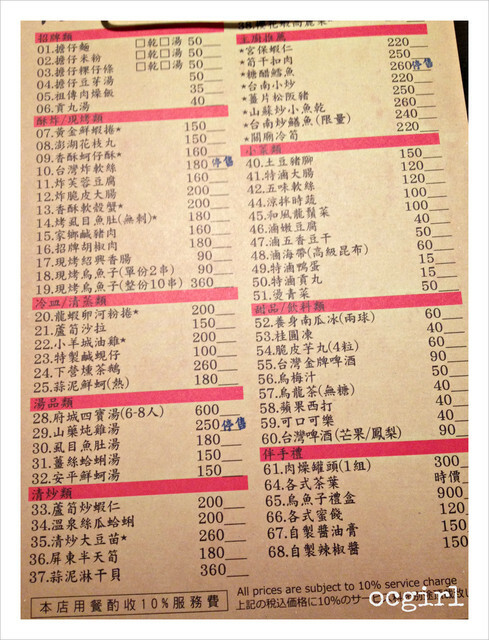 Most of them you probably have never seen in a American Chinese restaurant! The portions here are pretty small, so don't worry about overstuffing. 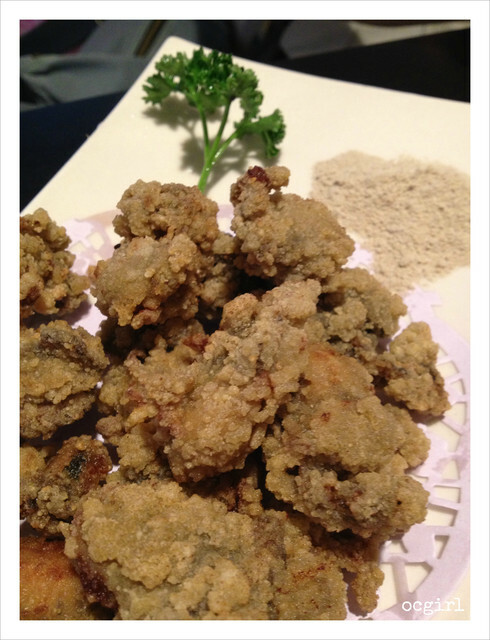 This is my MUST EAT Taiwanese dish, "Fried Oyster". Actually, I think I ate this whole plate by myself. Taiwanese oysters are pretty small compared to American Oysters, and it tastes amazing with the "white pepper salt" on the side. This one is more like a cold appetizer dish. 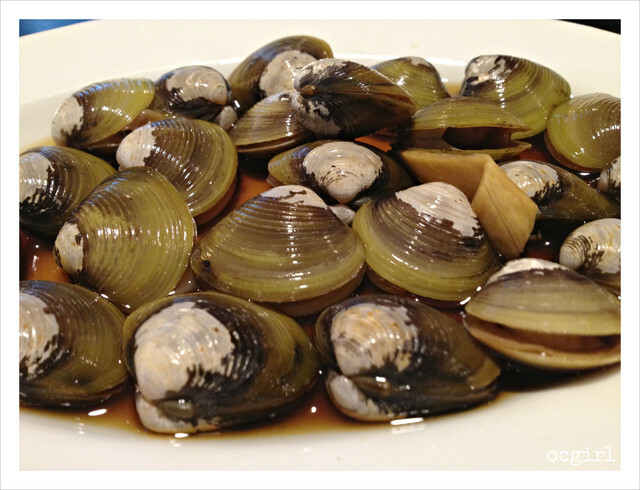 It's clams sauteed in garlic and light soy sauce. A good dish for hot summer days. The next two are ordered by my parents. My mom ordered "pig's feet". 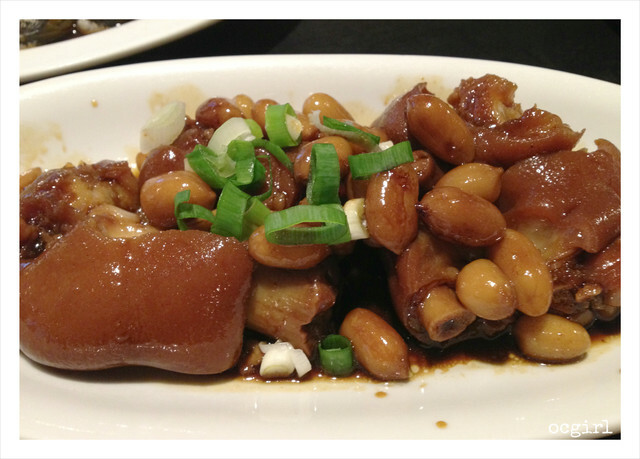 Pig's feet is another Taiwanese delicacy, but if you think that's too exotic for you, I kind of agree with you. It doesn't taste funky or anything, but I could never really get over the "pig's feet" concept either. 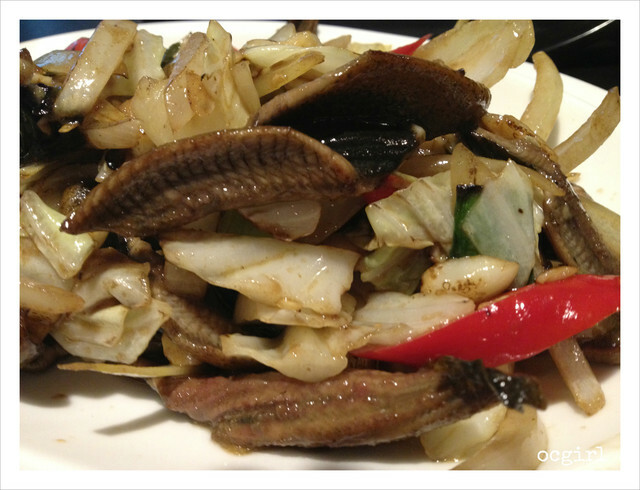 "Stir Fried Eel" is another famous dish from Tainan, so I guess it fits well with Du Shiao Yueh. It is another one of my dad's favorite, though I still like Hu Yuan's version the best.